Sound System Design & Optimization with Bob McCarthy: Bob McCarthy told us why graphic EQs are useless, common misconceptions about stereo, and why we must optimize our sound system design before we mix. 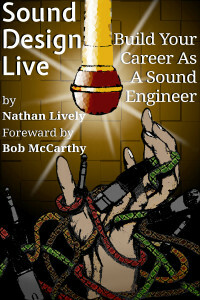 How Much Do Live Sound Engineers Make? : Salary information for four sound engineers in the U.S., Czech Republic, Slovak Republic, Greece, and Sweden. Condenser vs. Dynamic Microphones For Live Sound: Philip Graham of Ear Trumpet Labs compares condenser microphone and dynamic microphones for live sound, and discusses close miking and stage monitor feedback. From Highschool Dropout To Head Of Audio: An interview with the late Steve Brown about his journey from high-school drop out to head of audio at the Royal Exchange Theatre in Manchester. Condenser Microphones For Live Sound: Why are condenser microphones less common in live sound? What are the advantages and drawbacks? Listen & learn. I hope your year was as great as mine, and that you have many fun projects lined up for 2014. I’m looking forward to another great year on Sound Design Live, so if you’d like to hear an interview with a specific individual or read about a particular subject, let me know in the comments below and I’ll make your dreams come true.